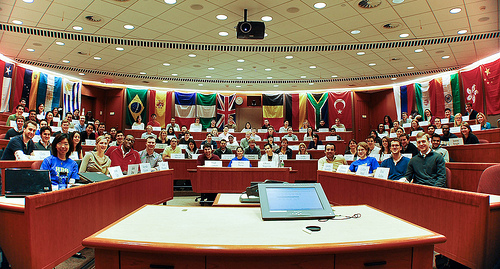 Today I finished my first year at Harvard Business School. I wrote the below post 10 years ago last week (on May 11, 2003)… at a similar point in life after finishing year one at UNC and just four weeks before starting Broadwick with Aaron, which became iContact. I didn’t quite do everything in the below post, but I came close! And I’ve decided not to pursue economics but instead continue on as an entrepreneur. Ten years later, tomorrow I’m off to SF to build Connect with the awesome team of Anima Sarah LaVoy, Zach Melamed, Lilia Tamm, Nick Gonzalez, Michelle Tabares, Jared Weinstock, and Liza Yermakova. We’re focused on the social mapping space. Remember my friends… believe in yourself, work hard, care deeply about others, be an optimist, live life with infectious enthusiasm, dream big, and make your dreams real. We may have only one life to live… so follow your passion and build something that makes the world better! Today also happens to be the first birthday of Connect! We’ve come along way since this post! We’ve had a lot of time to think deeply and prototype and now it’s time to execute. And so the journey begins. It began last Friday morning at 11:47am when I turned in my microeconomics examination and ran off to do three somersaults on Polk Place to mark the end of my first year at college. It will continue until August 14, 2004, my twentieth birthday. During the next fifteen months I will be up to exciting things. I will be on leave from UNC-Chapel Hill for the next two semesters, giving me the opportunity to focus on business, writing, and travel. Over the next year I will build another business to a million dollars in sales (this time, one of my own), publish Zero to One Million, build zeromillion.com, and launch an organization called The Entrepreneurs’ Coalition. Later today I am off to England. There I will be meeting up with my parents in Portsmouth for ten days, staying with a friend in Dublin for a week, and living with friends of my mum in London for three days. During this time I will be relaxing and going to pubs, seeing friends and family, attending a football match or two, finishing up the seventy-page, Life Plan of Ryan Allis, May 2003 – August 2004, reading profusely, writing part of Zero to One Million, and commencing the marketing initiative for the email list management software IntelliContact Pro, developed by my latest venture, Broadwick Corporation. Upon returning to Chapel Hill June 3, I will be ready to rock and roll. The first week in June I’ll have to go back to my parents’ home in Florida for a day or two to see some friends and purchase a car. I will then drive back to Chapel Hill and move my belongings from my office to my apartment. As soon as I get sorted, I’ll get going on the 100 hour weeks building Broadwick, finishing up Zero to One Million, and working with the Center for Entrepreneurship and Technology Venturing here at UNC. This summer I will also be a Team Leader for the LeadAmerica Business & Entrepreneurship Conference. I will be in Washington D.C. for a training session June 11-16, and then in Chicago June 20-29 and Boston July 18-27 for the conferences. The conference is for high school students and should serve as a wonderful opportunity for me to serve as a mentor to these aspiring entrepreneurs, build solid contacts, and earn street credibility that will help me further myself as a public speaker and writer on these topics. This past year at UNC, I have been working with my good friend and now UNC graduate Aaron Houghton. His company, Preation, Inc. has provided office space for my company, Virante, Inc. this year and together we have developed some very good web-based email list management software with some very key unique selling points and advantages to what is out there presently. We will be filing the articles of incorporation and transferring the software asset to the new corporation in early June. With my web marketing and business development expertise and Aaron’s programming knowledge, we should be able to build a solid business fairly quickly and bring on an experienced team to help us manage and grow the company. Zero to One Million, the book I began last July and the namesake for www.zeromillion.com, is on track to be published in early Fall of this year. Approximately one hundred pages are complete. The book will be a guide for aspiring entrepreneurs on how to build a million dollar company. The book is divided into seven sections, 1) The Entrepreneur, 2) The Global and Economic Framework, 3) Choosing Success 4) Building Your First Million Dollar Business, 5) Marketing Your Business to the Top 6) Managing Your Growing Business, and 7) The Case Study. I will be beginning an international speaking tour in September to promote the book. The book should end up around three hundred pages in length. It will be the first book that explains step-by-step how to build a company to one million dollars in sales. It will open up the possibility of entrepreneurship for hundreds of thousands of people and start a movement similar in scope to that started by the Rich Dad Poor Dad series. I fully expect it to on the New York Times non-fiction best-seller list within a year. Do look for it this fall. About the same time the book is being published, I will be launching the Entrepreneurs’ Coalition, an organization dedicated to building an international network of entrepreneurs. While there are numerous local entrepreneur groups, and a few international groups such as Indus and the Young Entrepreneurs’ Organization (YEO), I see two areas in the marketplace that are not being provided for. First, there is no international organization that caters to (non-collegiate) aspiring entrepreneurs. My friends at YEO are doing wonderful things, but to become a member of their organization you have to already own a company with a million dollars in sales. The Entrepreneurs’ Coalition will be a network of entrepreneurs at all levels. Secondly, there is a severe dearth of such organizations in the developing world and formerly-communist countries. The Entrepreneurs’ Coalition will connect entrepreneurs from every country and encourage the exchange of ideas among the business leaders of today and tomorrow. Central to the organization’s mission will be the development of web-based software that will provide a directory of entrepreneurs, a listserv, a community directory, and the ability for entrepreneurs to create their own subnetworks such as The Hong Kong Entrepreneurs Network or the ‘New York City Entrepreneurs’ Network or the Young Entrepreneurs’ Network. Finally, over the next year I am very excited to have the opportunity to work with the Center for Entrepreneurship and Technology Venturing (CETV) here at UNC-Chapel Hill. Continuing my work from this past semester, I will be completing the Distinguished Entrepreneur Interview Series, for which I will have the opportunity to interview about thirty successful entrepreneurs here in the Raleigh-Durham area who have built businesses which have sales of more that $5MM per annum. This will surely be a great learning experience. I also will be building CETV’s Entrepreneurship Resource Center and compiling content similar to that on zeromillion.com, in the hopes of furthering UNC’s image as a premier school for entrepreneurship education. How do all these plans work into my overall life plan? Well, my four main life goals at this point at to take a company public, write a book that sells 1,000,000 copies, set up a foundation to encourage education, reduce poverty, improve health, better economic conditions, encourage entrepreneurship, and prevent corruption in developing nations, and earn a Ph.D in economics and become a Nobel Laureate. I hope to incorporate the future-public company during this time, write the best-selling book, set up the predecessor to the foundation, and continue to learn about the market system and economics, two passionate interests of mine. Although, I may be wrong, I think taking this time off will benefit myself and others in tremendous ways and will be a good investment. Worse comes to worse, I can always return to school and finish up the two more years I need to graduate. We shall see. Meeting with Lisa Freeman, Senior Personal Finance Editor of CosmoGIRL Magazine, in Manhattan this past March was a very good experience for me. She emphasized the need for me to firm up my message, the one or two-liner that defined what it was I was trying to spread. She told me that with a good enough message and enough energy, that it really would not be too difficult to reach the major media outlets to spread that message. With a goal of mine to be on a major talk or television show such as The Today Show, Oprah, or a similar broadcast in the next fifteen months, it is time to develop this message. This journey will be exciting for me and hopefully will be very beneficial to both myself and others. I thank everyone who has helped me get to this stage and everyone that will help me going forward. To keep up to date on my progress stay tuned to www.ryanallis.com.